Hello everyone, I've recently laid my hands on this interesting piece of hardware and this post will contain everything I'll manage to learn about this board while I'm playing with it. This is an attempt to get together all those scattered pieces of information I found on the Internet. Quite predictably, I managed to brick Vocore while messing around with its operating system (the only working thing left in memory was the bootloader), so I'll describe how to easily get it up and running again. LED, any value resistor, any button or switch. Any USB to Serial board: ft232 based or noticeably cheaper ch340 based. Only for unbricking! One page you're going to look at a lot is this one.. All the essential information such as board layout, pin-out etc. is there. 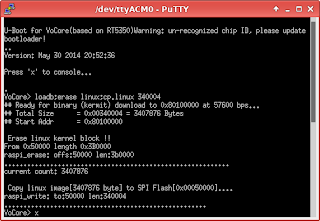 Vocore's operating system is OpenWrt, so you'll definitely pay a visit to their site once you've decided to rewrite the out-of-the-box OpenWrt build - for example, to get SPI working. 1.27mm pin headers on the left, 2.56mm headers to the right are for scale. Their pitch is 1.27mm and you should get female as well as male pin headers. Sideways pin header is still better than wires sticking out of every corner. So, you've finally got the package and you have this board in front of you. 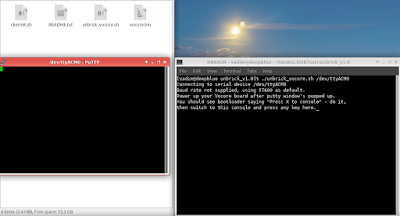 You probably already connected 5v to it, switched on your power supply and login'd via ssh. If you didn't, do it now. What's next? First, to be able to configure the kernel of Vocore and, more importantly, to get a cross-compilation toolchain, we will have to compile OpenWrt, which is the OS that runs Vocore. Optional: you can change whatever you want - e.g. change the SSID to something you like more, change the root password, add security to Wifi etc.. 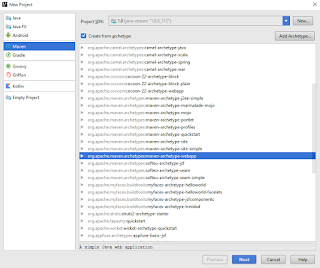 Optional: add or delete utilities, modules, features. Unset menu items only if you are sure what they mean. When I did it first time I went on a rampage and wiped all unnecessary (or so I thought) features which resulted in perfectly working kernel that didn't have WiFi drivers in it. -jN is the number of your CPU cores + 1. Just connect to Vocore AP and run Text that pops up in a windows is what you have to type in telnet window (Couldn't make ssh run a command even though it should be as easy as ssh user@host 'COMMAND'. Know how to do it? Please write a comment). That's it! Wait for the AP to reappear and you can telnet to your brand new custom OpenWrt. As you can see, I also hotglued miniUSB jack as a power connector. Quite handy. Controlling GPIO from command line is nice, but that's not how it should work, so let's compile and launch our first program that blinks an LED. 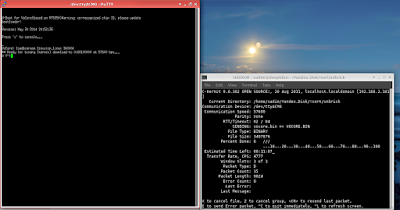 I'm using makefiles to automate compiling and uploading. to where your toolchain is located (it was built when you compiled OpenWrt) and run make in Blink directory. 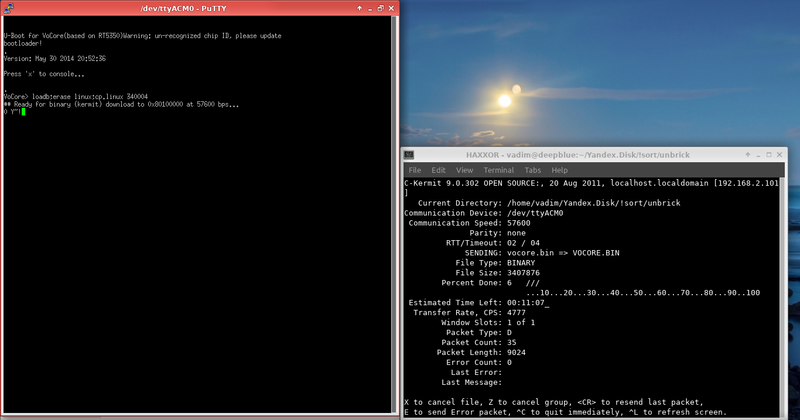 Make system will compile your program, copy it to vocore's /root and login you to telnet. You only have to launch it ./blink and look at the LED. Now that we've dealt with GPIOs in output mode, we have input mode ahead of us - that's what the button is for. If what you see is a page of '0's, 'F's or some rubbish that is inconsistent between spidev_test launches, check if your wiring (and insmod command) is correct and try again. UPDATE 2018.06.13: updated the script (got rid of zenity dependency), made some improvements in workflow description. 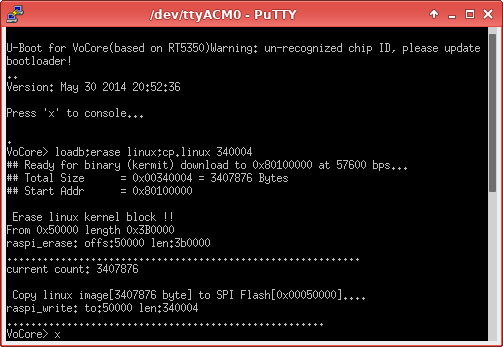 In fact, I bricked Vocore so many times I made a script that automatically restores the default firmware. You can get it HERE. 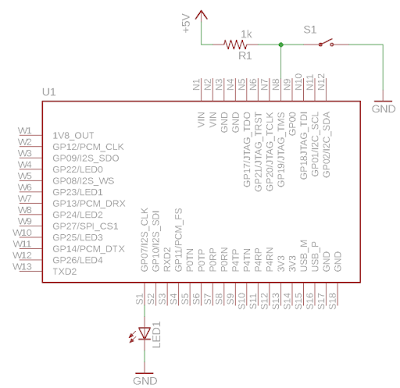 1) Let's begin by connecting USB-Serial adapter to Vocore's UART at pins 15 and 16. 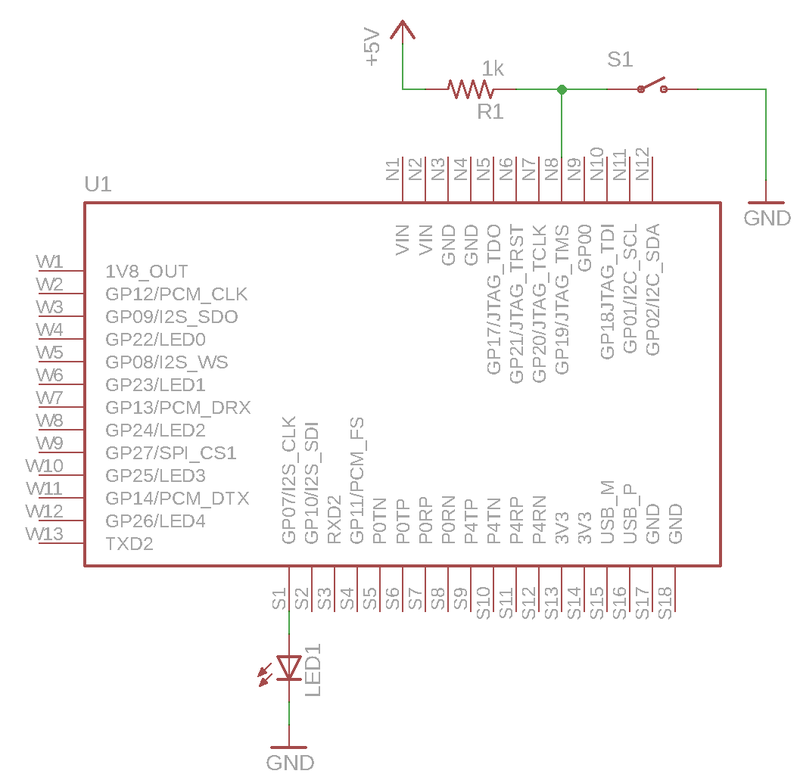 Using an Arduino Uno as a serial adapter. A close up of my piss-poor job at connecting RX and TX wires to Vocore. But hey, at least it's removable! That's me reflashing another Vocore, as you can see this one looks decent with pin headers and all. 2) Install putty. Add it to $PATH if you package manager hadn't done that yet. 3) Don't power up Vocore yet. I'll write about using CC110L with Vocore if I'll have enough time. Thanks Vadim for sharing, have a question. 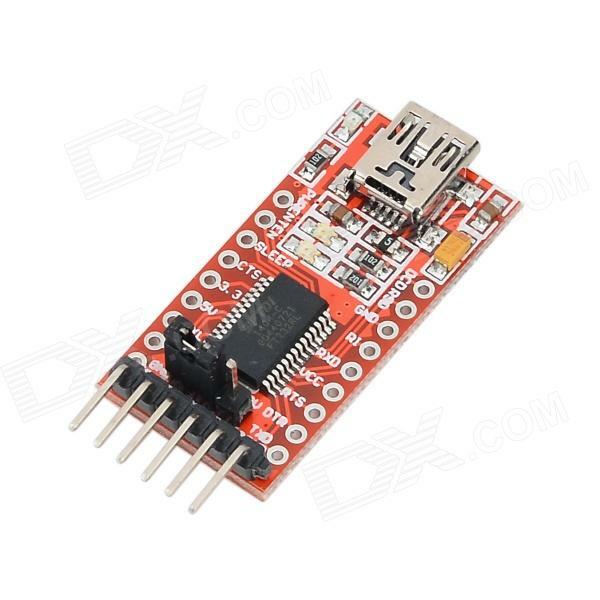 Is it possible to set wifi tx power to 0dBm on VoCore.